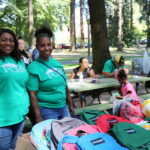 Portland Community Reinvestment Initiatives Inc. · Residents - Portland Community Reinvestment Initiatives Inc.
As Ms. Fitzpatrick recounts, Nadirah Gooden was living in a PCRI property with her family at the time she wrote the poem, which was published in the Oregonian in January 1996. “She is an extremely talented young lady and to write something like this at the age of 15 is impressive,” Ms. Fitzpatrick added. For many, Dr. Martin Luther King Jr’s landmark “I Have a Dream” speech is the most well-known part of the rally. The Oregon Historical Society, among other organizations, are hosting several events commemorating the 50th Anniversary of Dr. King’s speech and the March on Washington. Information about their events are listed HERE. Honoring the March on Washington – "I Am"
Having a bike is special for 6-year-old Ameia Vaughn. “I feel great when I ride,” she said. Ameia was one of many PCRI youth who received a bicycle with help from Resident Services Coordinator Lisa Williams. 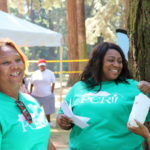 PCRI residents with children ages 3-8 were personally contacted by Williams who then helped residents register for Community Cycling Center’s 16th Annual Holiday Bike Drive, held on December 11. “You went out of your way to make this holiday season special for us,” said Courtney Roser, whose two children Veda and Cadence grinned as they took their bikes for a spin around the bike rodeo safety course. 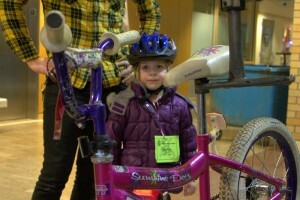 Before riding around the bike rodeo, the youth got to pick their new ride from a dizzying selection of bikes. Cadence (pictured below) was a bit shy in front of the camera, but was excited about her choice of bicycles: “It’s pretty and fun,” she said. This year, the Bike Drive provided over 465 bicycles, helmets and safety trainings to youth from partner agencies like PCRI. 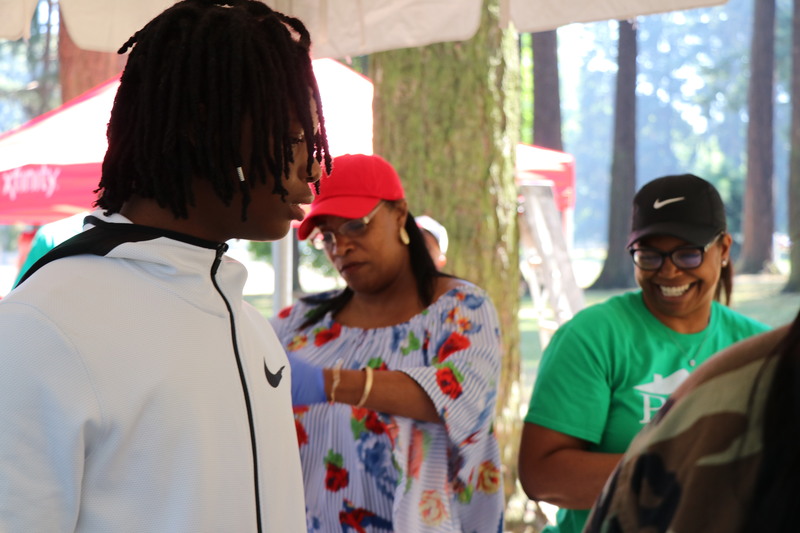 In addition to pre-registering the youth for their bicycles, Williams and PCRI staff member Travis Phillips joined the families at the event to ensure everything went smoothly. Judging by the giant smiles on the kids’ faces, everything went very smoothly. “I like to ride,” said Dominic Weatheroy matter-of-factly before pedaling around the safety course. His sister Iserael (pictured above) was just as excited to ride, but had some other priorities too. “It’s pretty with lots of colors and flowers,” she said, posing proudly next to her pink, purple and blue bike. To express our gratitude for organizing the event and providing the bikes, helmets and training, Williams and the new cyclists signed a giant thank you card. Williams delivered the card to the center a few days after the event and reflected on the difference made by her effort. PCRI also extends thanks to volunteer Izzy Ventura for capturing great photos of the kids during the Bike Drive. Nearly three years ago, George, a resident at PCRI’s Park Terrace apartments, delivered fresh greens to Resident Service Coordinator Amber Starks. 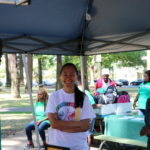 They may not have known it at the time, but the greens from George’s garden would grow into an opportunity to engage residents throughout PCRI’s community. Rewind to the winter of 2009-2010 when George delivered his green gift. Inspired by his beautiful, bountiful garden, Amber set out to create a space where all of the Park Terrace residents could grow their own fruits, vegetables and herbs. 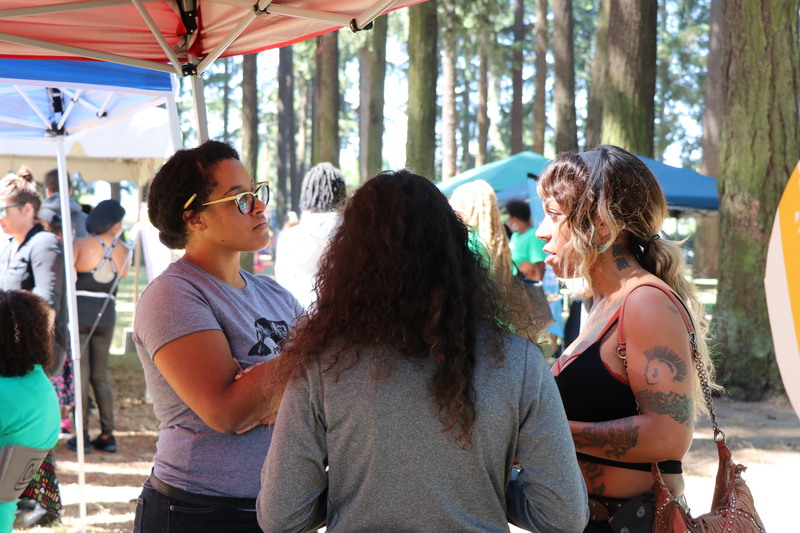 “I thought it would bring out residents who were interested in gardening, who may have had a garden in the past, or were looking to do something different,” Amber said. The 2010 garden was a bit of a challenge, she admits. While a few residents expressed interest, poor soil in the new garden area and limited time to keep up with it meant weeds were about the only plants that prospered. Amber resolved that 2011 would have a significantly better outcome. To attract help and involvement from the Park Terrace youth, Amber enlisted artist Dylan “Kauz” Freeman to create a mural. 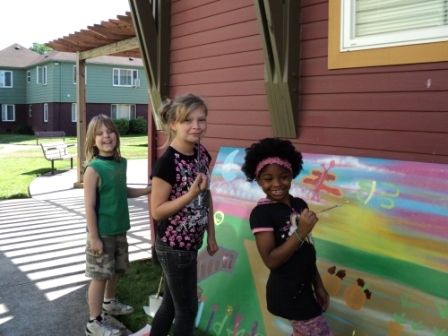 During the fall of 2010, Dylan and the youth brainstormed ideas, made sketches and painted a mural about what a garden meant to them. Their mural now overlooks the Park Terrace garden. 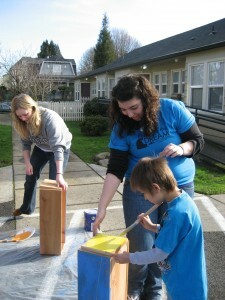 Park Terrace’s property management also joined in to make future gardens a success. Using concrete that had been removed elsewhere on the property, they created raised beds—one for general resident use and one especially for George, upgrading the space in which he had been gardening for years. The Park Terrace landscape maintenance crew added compost to improve the soil as well. 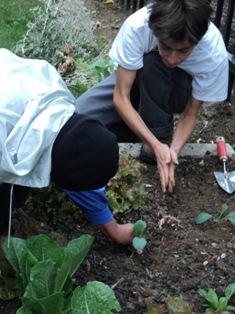 In the spring of 2011, volunteer Alison Coffinbarger applied her garden know-how in conjunction with starts and seeds generously donated by Portland Nursery. Alison provided hands-on instruction for the residents, sharing information about soil preparation, composting, companion planting and more. Every week, she would introduce the residents to two plants and offer tips on how to plant and care for them. The instruction and extra effort paid off, especially with the cucumbers. Park Terrace’s garden was so flush with cukes, a few of the residents took the bounty door-to-door, offering up their harvest to the resident seniors. Other crops took a while longer (as with most Portland gardens this year, the tomatoes were late to ripen but are now offering their delicious fruit to residents’ kitchens). Still, every planting offered at least a taste for the resident gardeners. 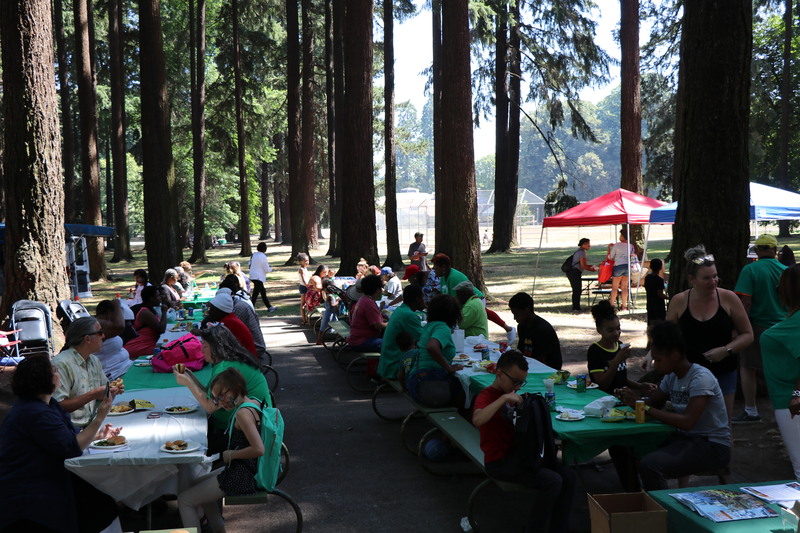 Participation increased as residents saw the harvest in Park Terrace’s community center and got involved in planting and maintaining the garden. In addition, Amber is already planning the fall and winter garden with hardy crops like kale, collards and other greens. She’s also looking even further down the garden rows toward a “planting to plate” experience where residents will learn how to garden and then learn from a chef how to cook what they grow in a variety of ways. 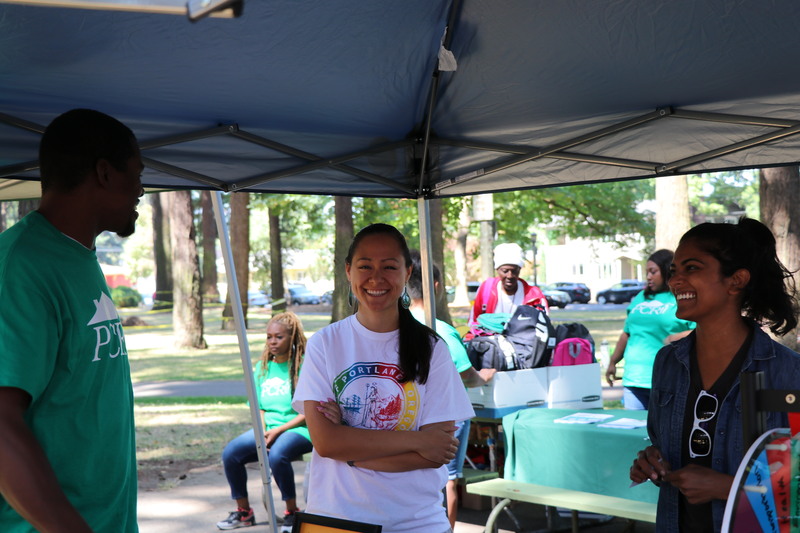 Residents interested in participating in a community garden and community members interested in volunteering or donating can contact Amber Starks, Resident Services Coordinator, or Adriana Voss-Andrae, Healthy Foods Access Program Manager. A Week of BBQ and Soccer! The end of September saw a busy week here at PCRI. 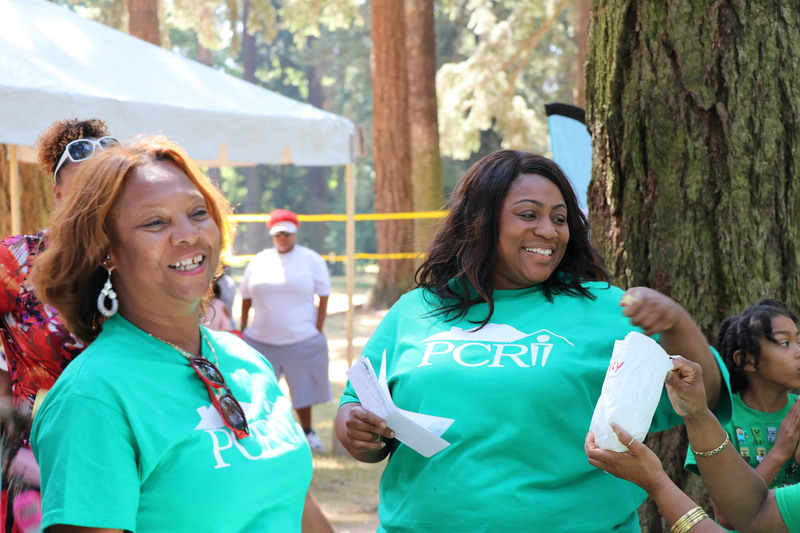 On Sunday the 21st, PCRI hosted a barbeque at Peninsula Park for our residents. 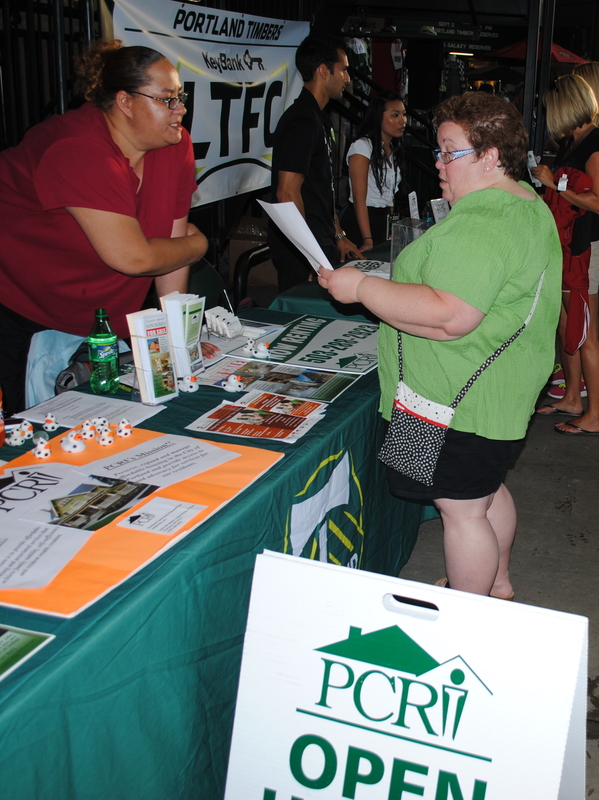 And on Wednesday the 24th, PCRI joined the Portland Timbers as a benefit partner for the Timbers game against rival Chivas USA. First on the calendar was our resident barbecue. 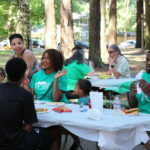 Portland’s on-again, off-again summer weather cooperated perfectly for nearly 100 residents to turn out for burgers (traditional and veggie alike) and hot dogs under the welcoming shade of Peninsula Park’s trees. Many residents took advantage of passes to the park’s pool to beat the heat as well. 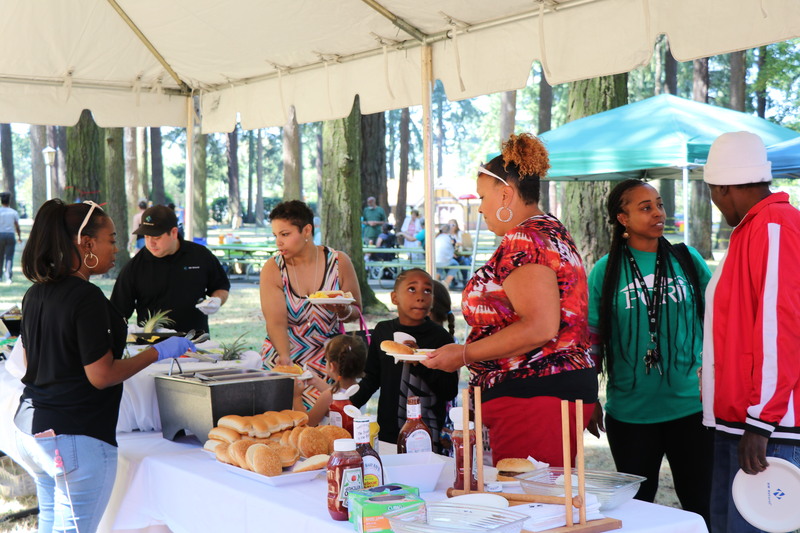 While the burgers–and especially the ice cream–were in high demand, the gathering also provided the opportunity to build community among PCRI’s residents and to introduce residents to the varied programs offered to them. 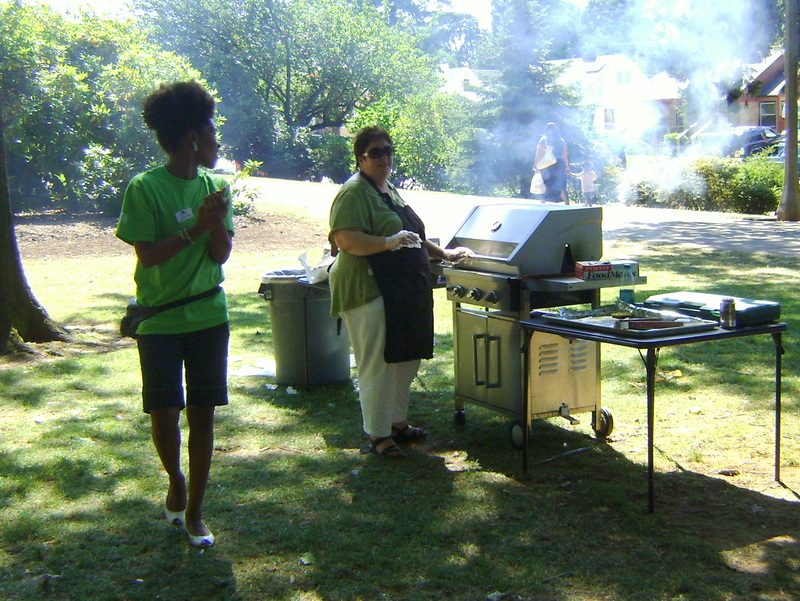 It was also a great chance for residents to meet staff members (Amber, left, and Cyndi are pictured at the grill) they may not have contacted before, not to mention for staff to meet the residents. 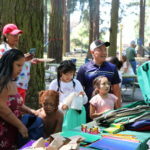 As the grill was cooling down, face painting by artist Christian Grijalva, a BINGO game and raffle prizes kept things going. 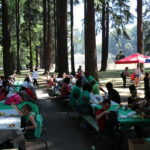 Of course, without generous donations from Fred Meyer, Starbucks, Tonalli’s restaurant, Mid-K Beauty Supply and Geneva’s hair salon, we wouldn’t have had the great prizes for the BINGO game and raffle, so we extend huge thanks to our donors (and when you stop in to support them, be sure to say “Thanks” for donating to PCRI)! While we’re extending thanks, a great big one goes out to the Portland Timbers! 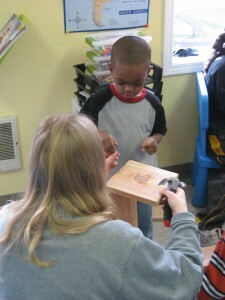 We were excited to join the Timbers for the second year in a row. 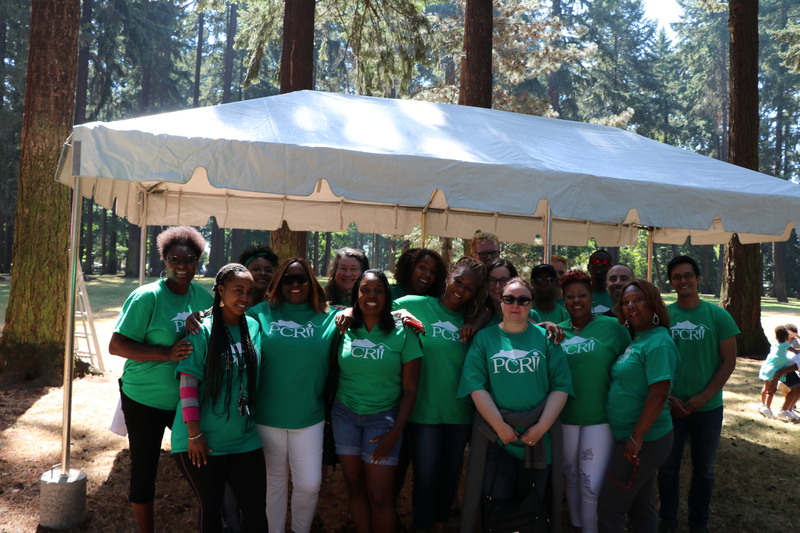 Even better, the Timbers won their game against Chivas USA on August 24, and PCRI raised $1,750 thanks to donations at the game and sales of the benefit tickets. Our table on the concourse of Jeld-Wen Field gave us a great opportunity to connect with new friends and supporters as well. 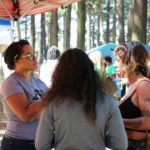 In fact, Yolanda (at left in the photo, but often spotted at the front desk at PCRI) took the chance to talk available rentals with some Timbers fans. We’re already working on future events–for residents and for our friends and supporters, so stay tuned for more information! 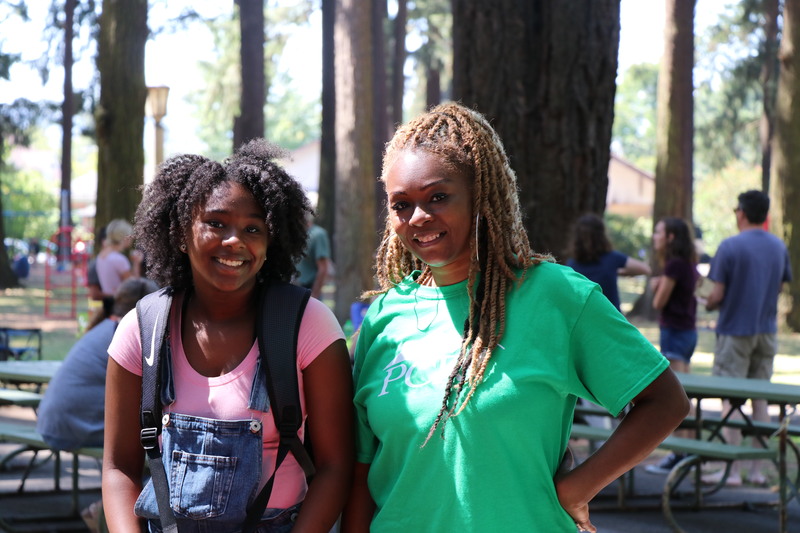 Around PCRI, we’re always eager to share great stories about our staff and residents, but we’re especially enthusiastic when they’re about PCRI youth. 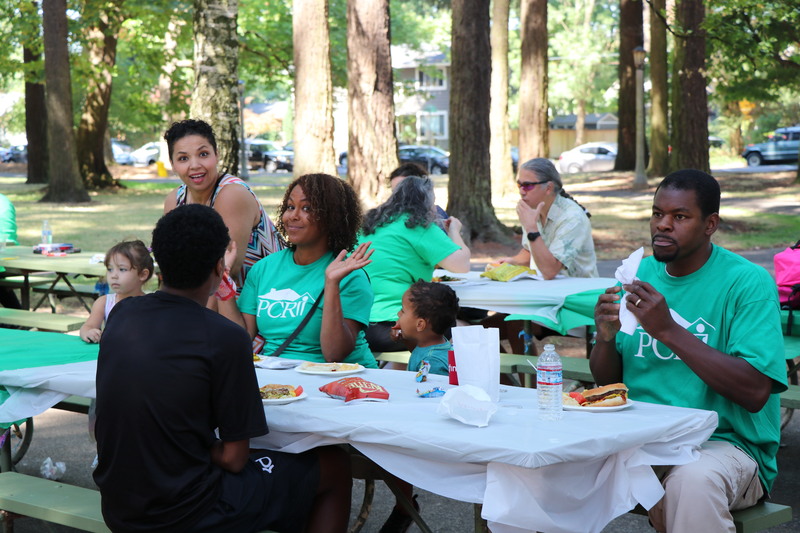 As one might expect, when we heard through the grapevine that Marius, a PCRI youth, joined forces with the City of Portland as their Green Building events Intern, we were excited. And as we learned more, the connections back to PCRI just kept popping out. Marius and his family came to the United States a year and half ago from the Congo and lived in Tanzania for eight years before that. Since he’s been in Portland, Marius has been chalking up some pretty impressive accomplishments: he graduated at the top of his class this June from David Douglas High School and he’s on the Multnomah Youth Commission. He’s received a Future Connect PCC scholarship where he will begin in the fall taking pre-pharmacy and other general classes. 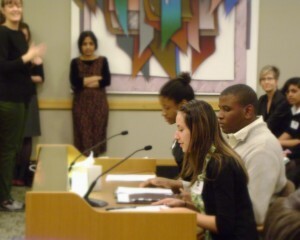 At the City of Portland, Marius will be working closely with Valerie Garrett, the Regional Green Building Hotline Coordinator. 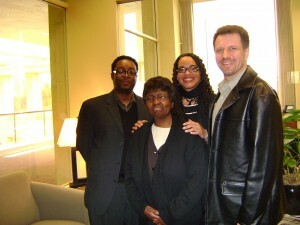 (Valerie also has ties to PCRI: she is a former staff member). Marius will be learning about green building and climate change during his internship and will assist Valerie with outreach, public relations and recruiting of volunteers for the 2011 Build It Green! Home Tour on Saturday, Sept. 24 (PCRI has participated twice on the home tour, but we’re sitting it out this year). Of course, we extend our congratulations to Marius on his internship and we know he’ll be in good hands working with Valerie! Congratulations to the TEENS project! 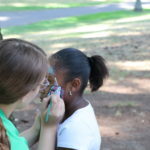 This spring, the American Leadership Forum of Oregon created a new contest for middle and high school youth called the Oregon Youth in Action Contest. 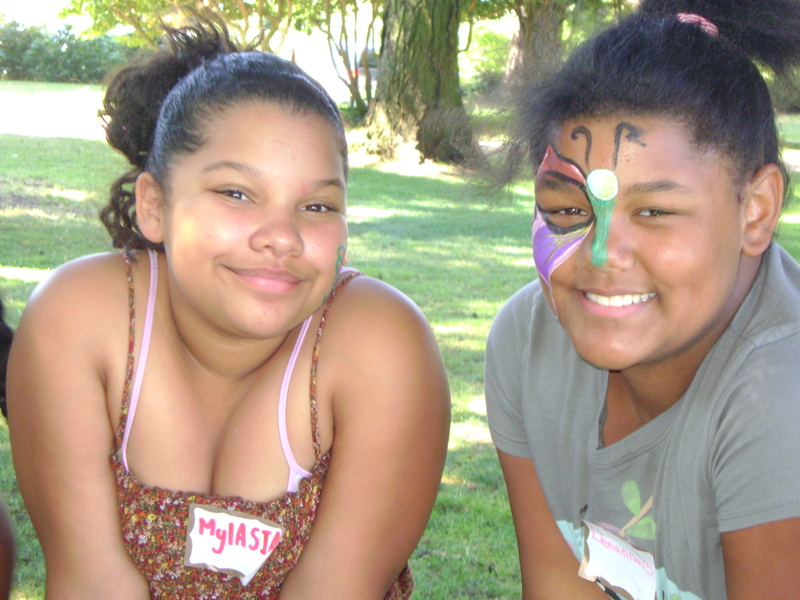 This contest challenges youth to develop innovative projects that promote healthy bodies and healthy communities. PCRI is exceptionally proud that of the 27 applicant teams, PCRI’s team of youth was one of nine winning entries. 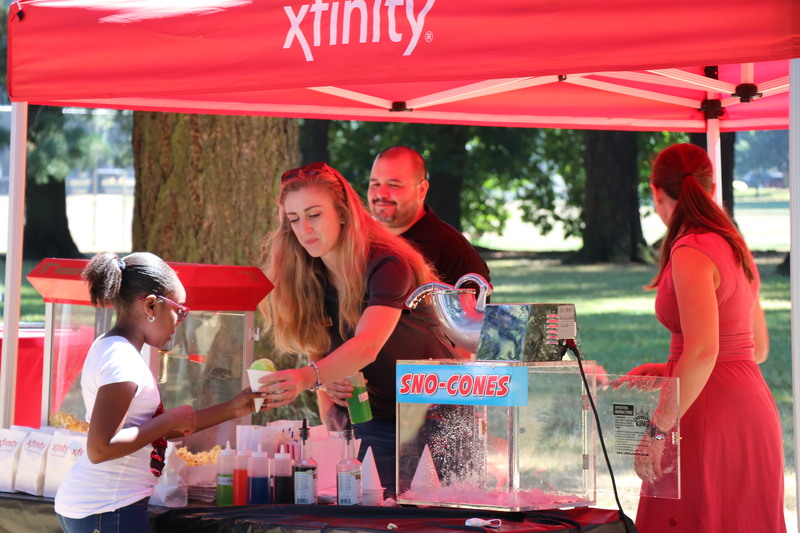 Marina, Grant and Tosha’s winning project, “Teenagers Engaged in Eating Nutritious Snacks” (TEENS), received a $2,000 implementation grant which will help the team successfully create a healthy snack. 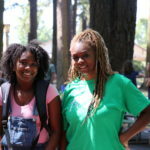 The TEENS project, sponsored by PCRI, will create an affordable and healthy snack which will be for sale at the Village Market store located in New Columbia. This store was designed to provide healthy food options in the community. 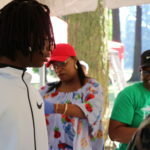 Marina, Grant and Tosha will test market and survey community teens, work with a chef to develop the product, design appealing packaging, locate production facilities, produce and distribute the snack and gather opinions of shoppers who buy the product at Village Market. 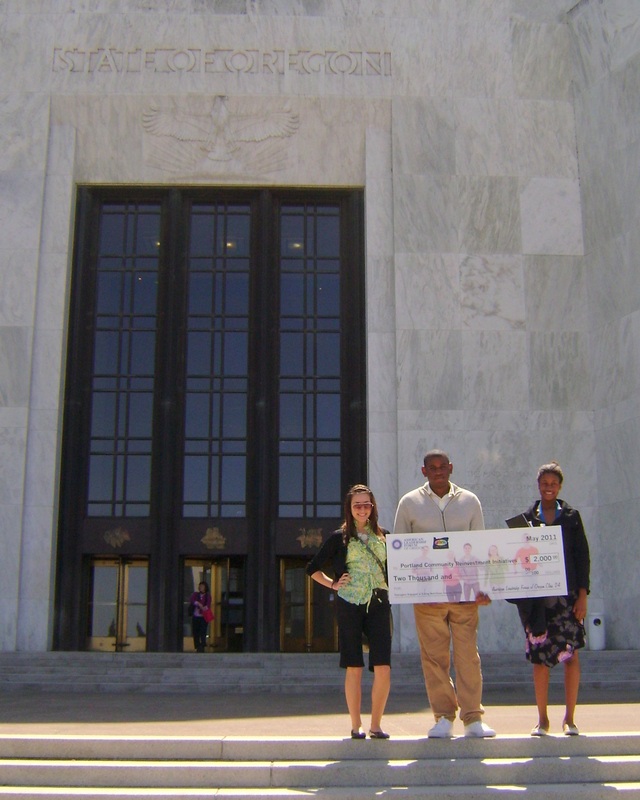 At the Award Celebration in Salem last week, the trio of PCRI youth and other state-wide team winners met with Oregon State Senator Chip Shields and Governor John Kitzhaber; each team presented their project to the Human Services Committee. 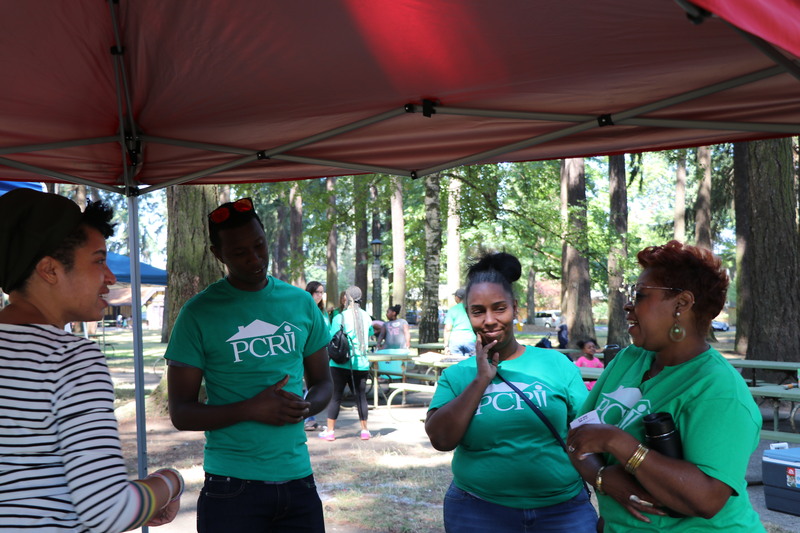 PCRI youth presented their project with this ultimate goal: get youth in their community to appreciate and eat wholesome foods, and help create a snack that is both affordable and accessible. 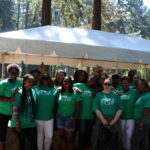 The event, created by Class 24 of the American Leadership Forum of Oregon, was designed around First Lady Michelle Obama’s national campaign called Let’s Move. 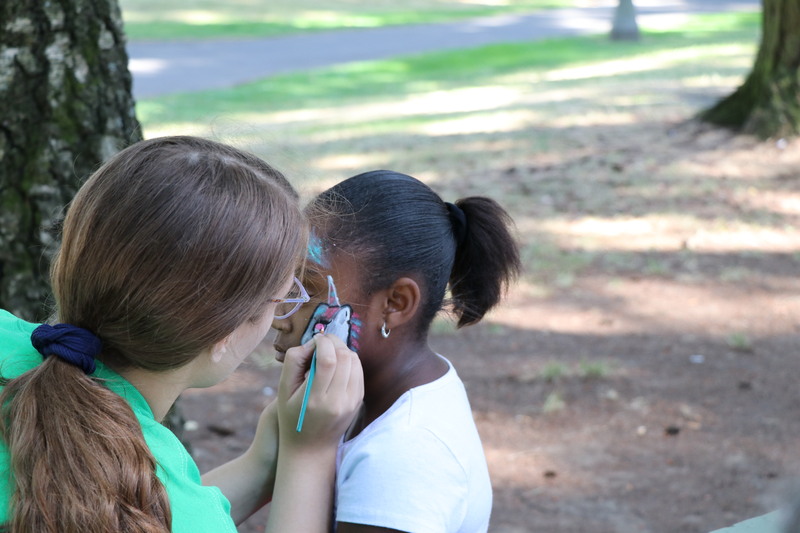 The Let’s Move campaign’s objective is to engage Americans in raising a healthier generation of kids. 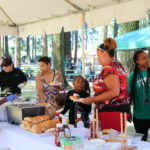 PCRI is thrilled to support the youth in this worthy endeavor. 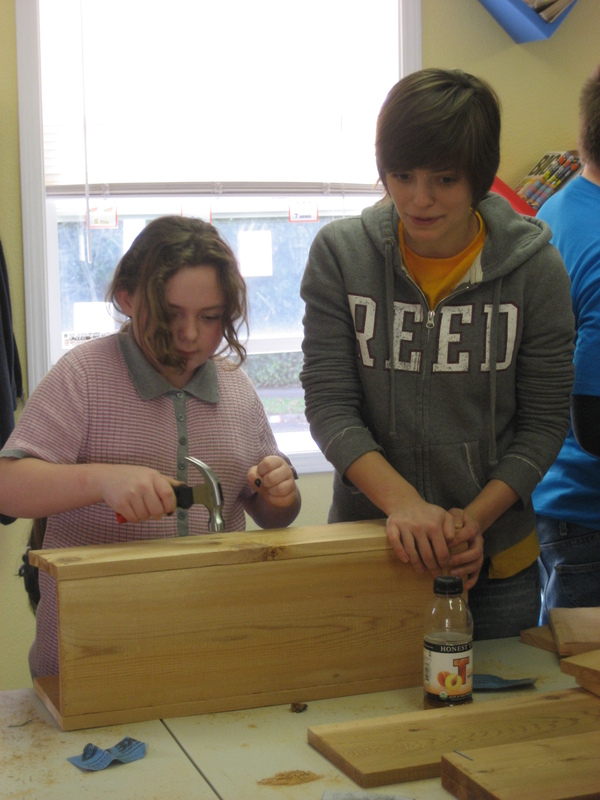 Their talents and creativity are sure to make an impact in the community. For more information about this program, call Julie at 503-281-1778 or email Julie@pcrihome.org. Betty Mason always dreamed big. 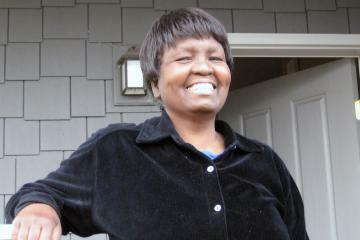 As a longtime renter and PCRI resident in northeast Portland, Betty (pictured below in front of her home) took the first step in 2007 toward making her dream of homeownership come true. Today, she owns the single-level home of her dreams: close to parks with lots of windows and a big porch like she always wanted. Feeling excited, overwhelmed, scared, doubtful and elated, Betty ran the gamut of emotions that come with buying a first home. 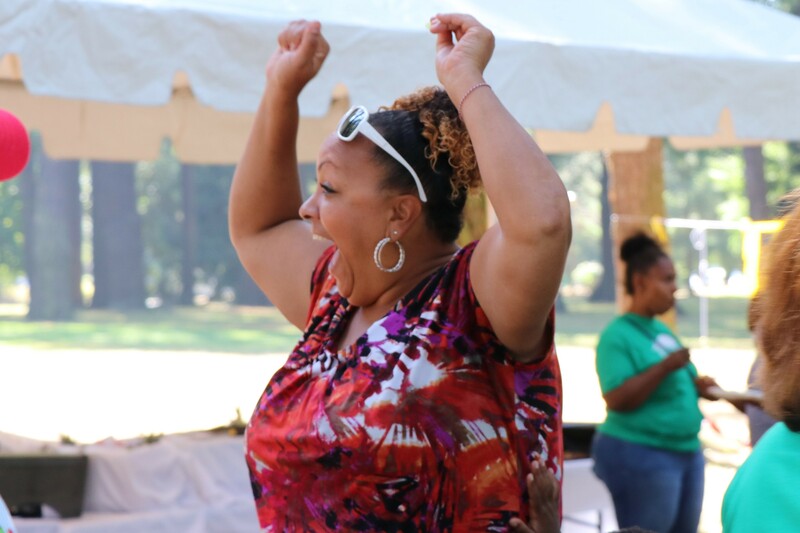 But PCRI’s Homeownership Program had her back the whole way. 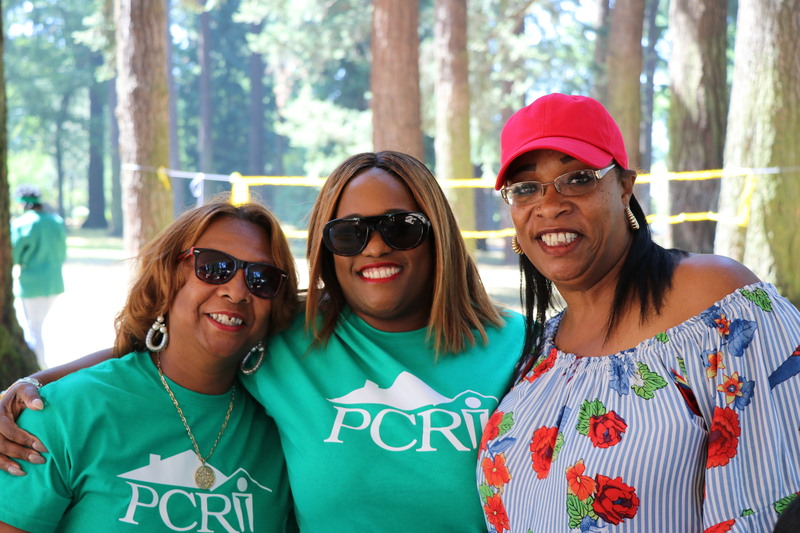 At closing, her team of support including PCRI Homeownership Program Manager Charles Funches (pictured below on left) and real estate agent Shelly Fullwiley (pictured below, third from left) joined her. 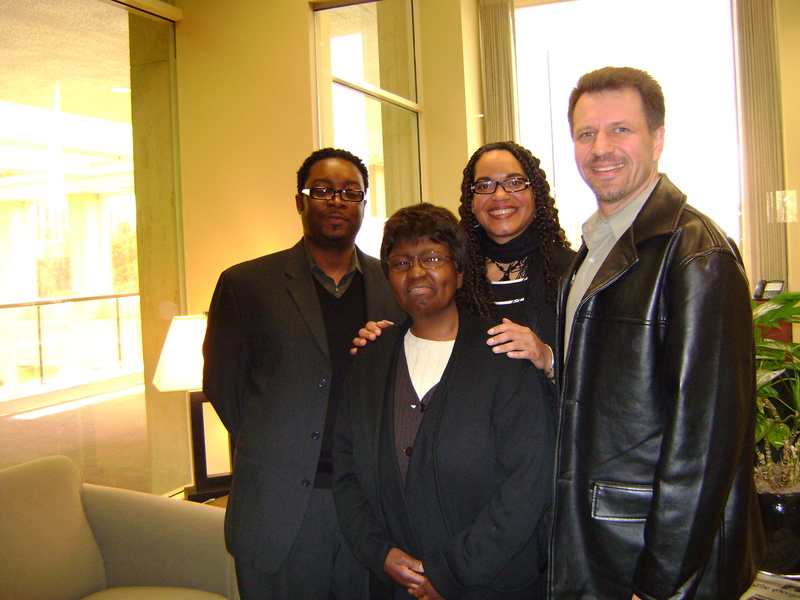 “They changed my perspective to prepare for homeownership,” Betty remarked. 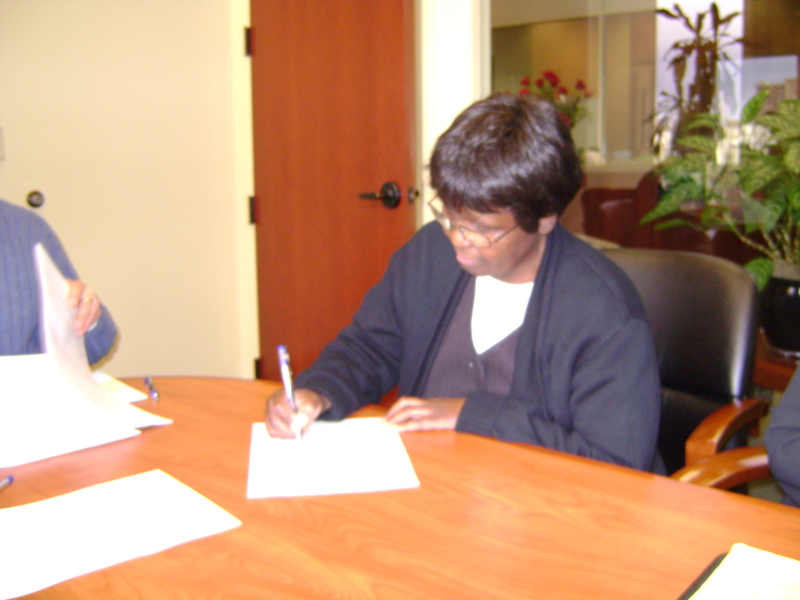 PCRI’s individualized approach and homeownership support don’t end when a new homeowner receives her keys. PCRI’s programs and resources remain available and homebuyers are encouraged to participate in post-purchase education programs. Referring to her homeownership refererence guide from PCRI, Betty feels confident that she has the tools and support to maintain her home. “I’m stronger than I thought I was,” Betty reflects. 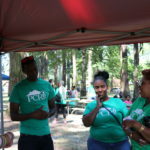 She is also quick to express appreciation for PCRI’s expertise, patience, kindness and desire to empower the community. Betty is one of 12 families PCRI helped become first-time homeowners in 2009. 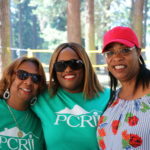 PCRI gives special thanks to VIDA of Oregon for their support as well as helping to share Betty’s story (much of which as been duplicated here). “I am happy to join with you today in what will go down in history as the greatest demonstration for freedom in the history of our nation,” said Dr. Martin Luther King, Jr., starting his now-famous “I Have a Dream” speech on August 28, 1963. 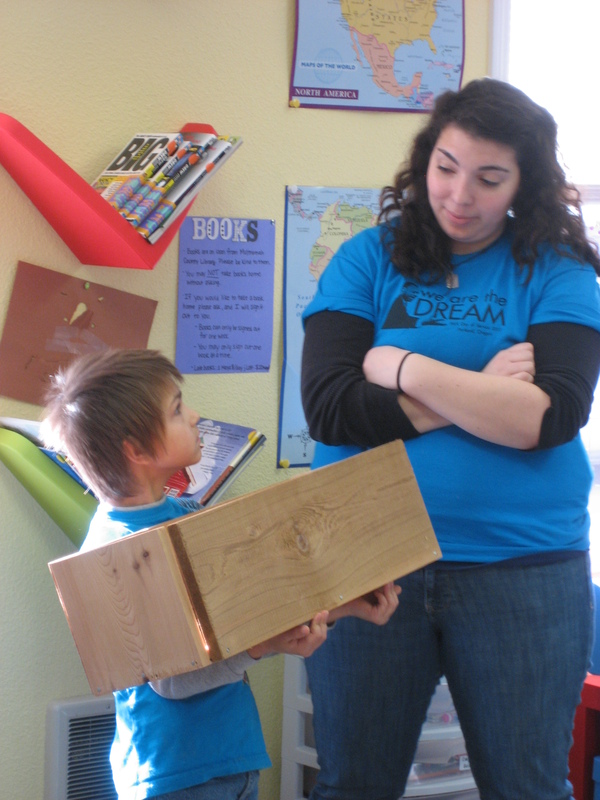 In Dr. King’s honor, volunteers from Americorps and Hands On Greater Portland joined children at PCRI’s Maya Angelou Community Center to build planter boxes for families at the Maya Angelou complex. 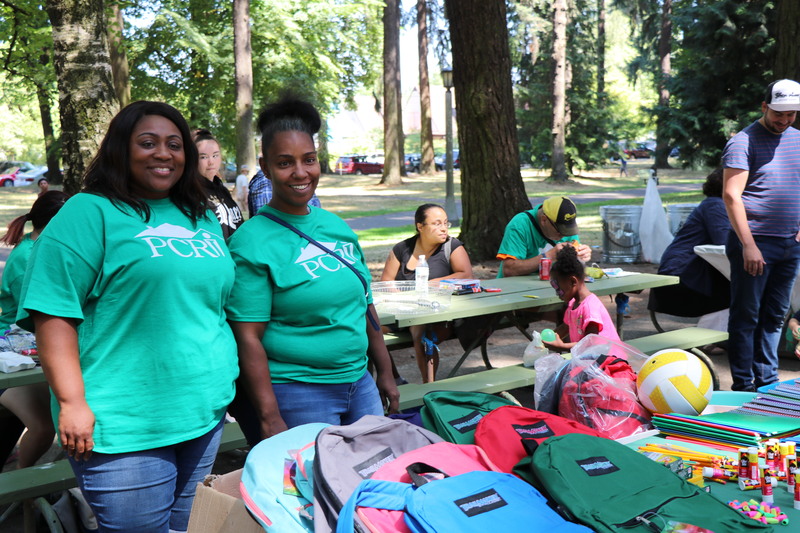 Cassie Russell, PCRI’s Resident Services Coordinator at Maya Angelou Community Center (and also an Americorps Oregon State Service Corps member), organized the day of service; Home Depot, Sherwin Williams and Hands on Greater Portland donated supplies for the event. The box-building teams started indoors, making rhythm from the scratch-scratch-scratch of their sandpaper and the thump-thump-thump of their hammers. The percussion of the tools could only be drowned out by the repeated interruptions of laughter. Once the boxes were built was when the real fun happened: the kids and adults grabbed their boxes and hustled outside (hey, the sun was actually shining!) where they let loose their creative genius. 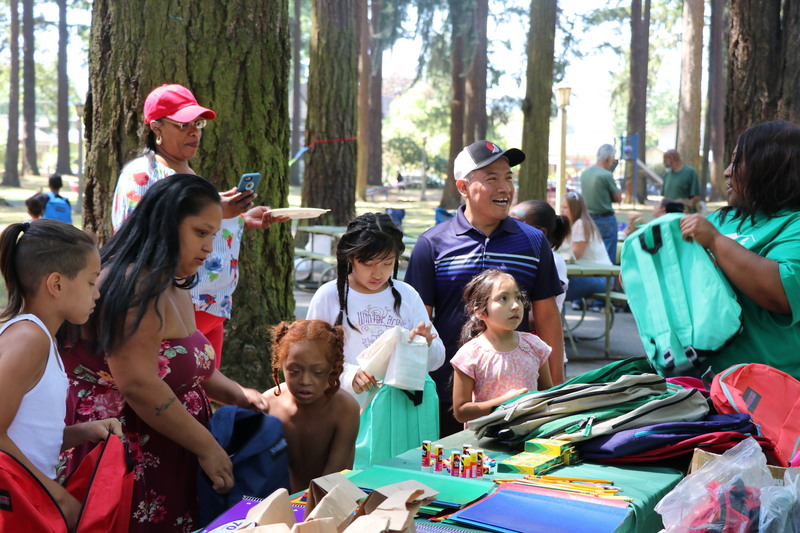 Some kids (and adults) went all-or-nothing with the bright colors, while others took a more subtle approach, decorating the boxes with painted flowers and trees. Once the boxes were painted, the builders stepped back to reflect on Dr. King’s inspiration, their work–and to let the paint dry–over a few slices of pizza. Check out our photo gallery (and become our fan for more updates!). What’s next? As the weather warms up in the coming weeks, it will be time for the families to start their planter gardens with seeds donated by Seeds of Change. Who knows–maybe a contest will be in order: I have a dream that one day, we’ll be judged not by the color of our skin, but by the content of our … planter boxes? 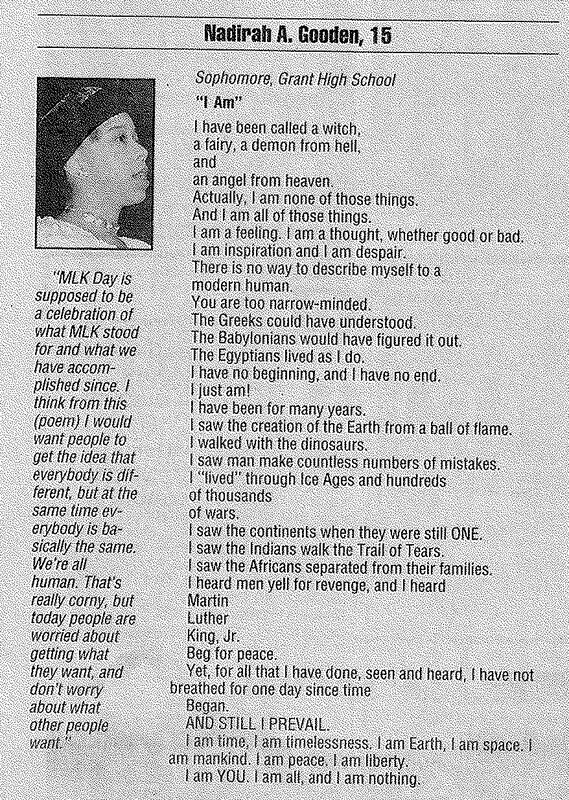 Hats off to Dr. King for providing such great inspiration.